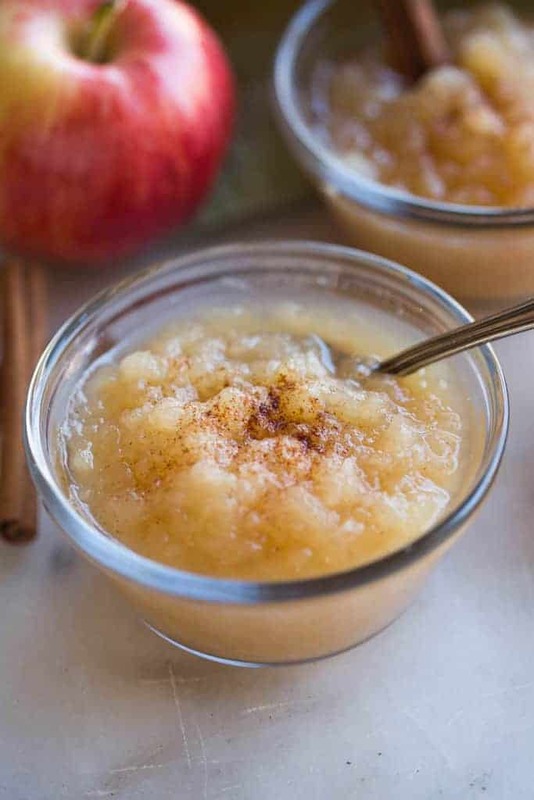 Delicious homemade applesauce just got easier, made in the instant pot or slow cooker. 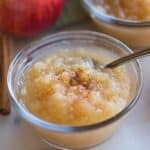 This Instant Pot applesauce recipe has no added sugar and can be made in just 15 minutes. Did you know that not all applesauce is created equal? That’s the truth. Any time I’m forced to buy store-bought applesauce it’s a strugggggle. It’s like buying store-bought jam. Every single brand and type has so much sugar, and most of them don’t even taste very good. Am I sounding like a total applesauce snob? I’m sorry, but homemade applesauce is just so easy and so GOOD, especially if you have an instant pot. The first time I made applesauce in the instant pot I was blown away. That machine just continues to amaze me! (I have this 6qt instant pot). It was so incredibly easy and turned out perfect, with very little time or effort on my part. First, you choose your apples. I like a blend of sweet and tart apples to make really great flavor for the applesauce, without having to add extra sweetener. Granny Smith and Honey Crisp combination is definitely my favorite. Peel, core and slice the apples. I use a johnny apple peeler to peel, core and slice the apples super quickly. 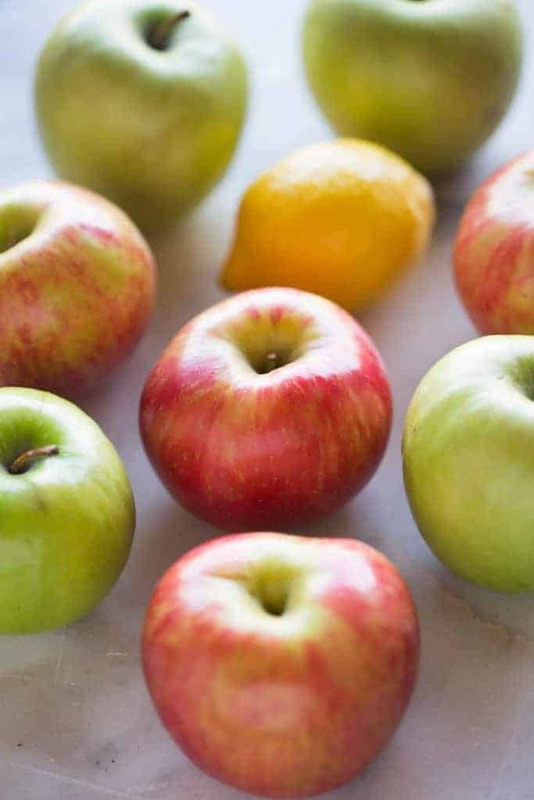 Add your apples to the instant pot. Toss the apples in water, cinnamon and lemon juice, and cook them on manual or high pressure for 8 minutes. After a controlled quick release, open up the lid and the apples have literally turned to applesauce! You don’t need to do anything but give them a little stir. The taste is AMAZING–perfectly sweet, especially with a little extra cinnamon on top. If you used different apples, and feel that it needs to be sweeter, you could add some white or brown sugar. I love applesauce that I can feel good about feeding my kids. I know exactly what’s in it, and everyone LOVES it! It’s its own type of delicious comfort food, don’t you think? If you don’t have an instant pot you can make this applesauce in the slow cooker! 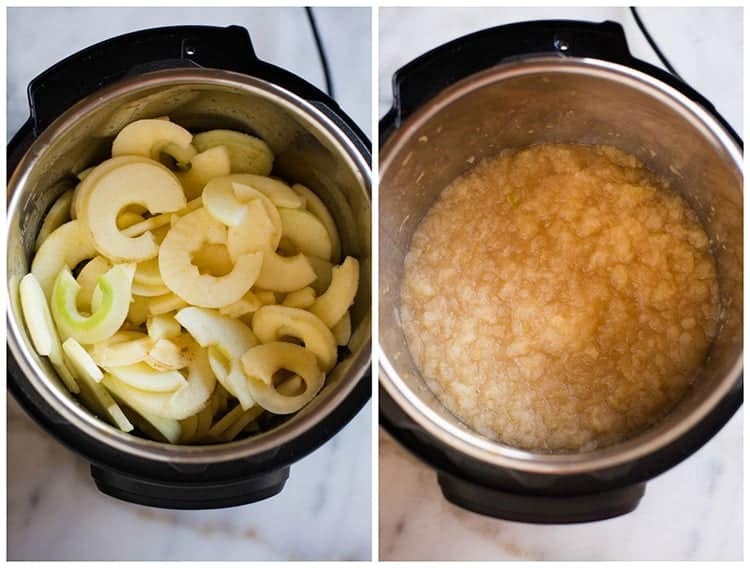 Add the peeled and sliced apples to your slow cooker. Toss in lemon juice and cinnamon (no water needed)! Cook on LOW for 4 hours. Pour into blender and blend until smooth, or desired consistency. Store applesauce in the fridge for 7-10 days. Peel and core apples. I use a johhny apple peeler to do all three steps at once (peel, spice and core). Add water, lemon juice and cinnamon to instant pot and stir to combine. Add apples and toss to mix. Secure lid and cook on manual (high pressure) for 8 minutes. Do a controlled quick release or allow the pressure to naturally release. Transfer contents to a bowl and allow to cool completely. Stir in more cinnamon, if desired, to taste. Enjoy warm or cold. Store in the fridge for up to 7-10 days. *Directions for making applesauce in the slow cooker are detailed above in the post. Canning· Instant Pot· Kid-friendly· Sides· Slow Cooker· Snacks/Misc. 1 cup of watery isn’t too much? Other recipes call for less water. Won’t be too watery? I only have honeycrisp apples, can I use all of the same apples and this recipe will still work? I have never made applesauce. thanks! Put mine in quart jar in frig! Have you ever tried freezing your applesauce recipe? I haven’t but I don’t see why you couldn’t 🙂 Enjoy! I used ~12 Macintosh apples and only a half cup of water (as they are softer than Granny Smith and honeyscrisp) and left out the cinnamon. I did leave the peels on and then pulled them out with tongs after the pressure was released and puréed them before adding them back, to keep more of the nutritional value. While the apples filled the 12 cup instant pot almost to the max line originally, it cooked down to only 8 cups of sauce. Cooking time was spot on! This worked well for me. I only had 4 apples (fuji & honey crisp), so I used half the water. I left the skins on after reading how much nutrients they contain. I used a purée wand and the texture turned out perfect for me. It was a little tart, maybe because I used all the lemon or maybe because of the skins. So I did add a couple tsp honey. What a treat to have for breakfasts this week- Thank you! So I followed this recipe exactly. When I did a quick release, the pot started spewing steaming apple juice and the overflow container started filling up. This never happened with any recipe before. The pot was barely full so there was not too much in it. Any idea what may have happened? Followed the recipe exactly and its so good! I have a toddler and I love being about to make food for her so I know exactly what is in it. I’ve also eaten just as much of it as her! Added bonus, it made the house smell awesome while cooking! Yum! Enjoying a nice warm bowl of this right now! Threw a few pecans on top-fabulous! Will definitely make this again, so simple.